Dawn is fast approaching as the young men roll up to the beach, wade through the water and clamber on board a local fishing dhow. As soon as everyone has settled in, a boy of about 14 pushes off with a long bamboo pole. A man wearing a black t-shirt and a blue lycra woman’s swimsuit rolled-down at the waist, ties a rope to a roughly cut boom; six men secure the rigging and proceed to raise the mast.The shoreline recedes, the sun reflects yellow on the ripples of the sea. The men wear cutoff jeans and track suit bottoms, football shirts, white vests, faded tshirts. Their feet are weathered, their toenails inch-long slivers, their hands look like hard, seasoned leather. 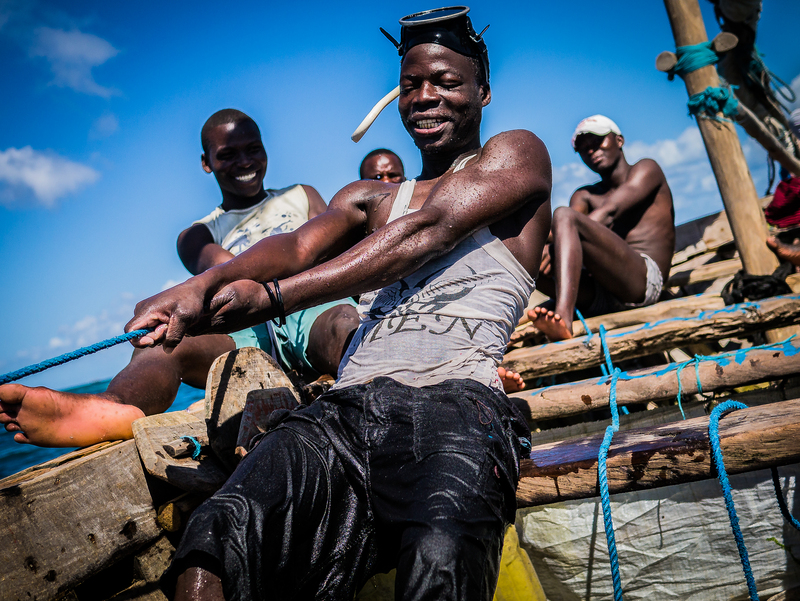 These men are Macua fishermen from Mozambique Island, “Ilha” (pronounced Ilya) in the local parlance, an island measuring approximately 3kms by 500m in the north of Mozambique. During four centuries of Portuguese rule, Ilha served as their main eastern African port and capital. Prior to the arrival of Vasco de Gama, in 1498, the island hosted an Arab settlement that had been active for over 500 years. 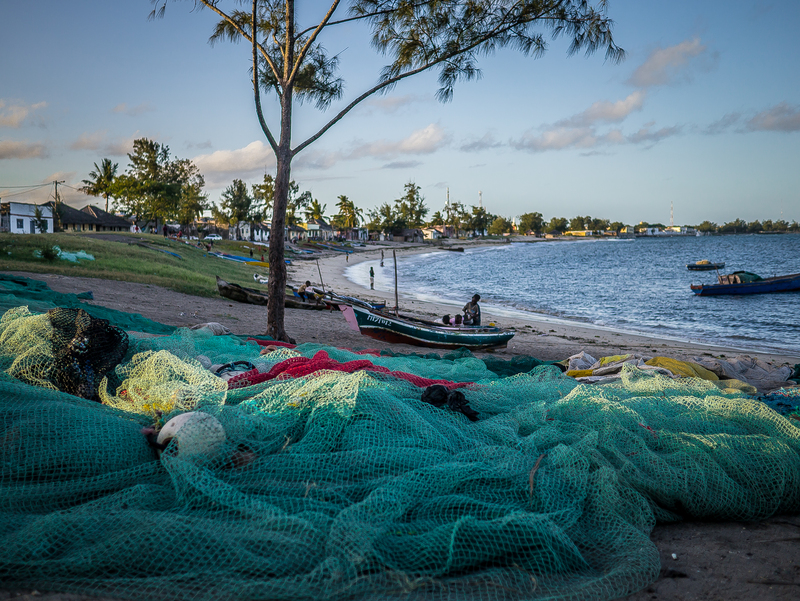 The single most important aspect of the economy of Ilha is fishing. Beyond small-scale informal trading – Chinese plastics, vegetables and other foodstuffs brought from the mainland, basic carpentry workshops, shack restaurants and the beginning of a tourist trade, fishing is the main source of subsistence for residents there. Back on the dhow and the crew of nine are beginning to fully wake up: conversations start, jokes are shared, laughter erupts, a bag a raw peanuts is passed around. The dhow is a simple structure: a wood skeleton made of untreated rough pieces of timber enclosed by sanded planks that make up the body. There is no floor, feet rest directly on the inner frame. In the middle a tarpaulin is placed with its edges hanging over two opposing benches. A green film of mould covers the entire hull. After ten minutes the sea begins seeping through the cracks. The water will eventually be bailed out by a plastic cooking oil container cut to form a scooping device. The nets – green, turquoise, red and black, are piled high at the back. The sail is composed of large strips of canvas that over time have been patched up with gunny sacks originally intended to carry rice and flour. The sail is splitting at the seams and weathered with a myriad of little holes and frayed rips. Further out, tens of similar dhows pepper the horizon. Two masks and a snorkel lie in the skeletal hull. The masks are oval and don’t have a fitting for the nose; a thin piece of aluminium seals the transparent pane to the rubber grip that surrounds the face. The snorkels are a rigid plastic tube that has been melted to curve into the mouth. After less than an hour’s sail, the dhow approaches a small island. A man in his twenties dons a mask and snorkel and jumps in. This is Molde, brother of the owner of the boat and the man who holds the most valued job onboard: he is the fish scout, the person responsible for diving in and indicating to those onboard where there is a high concentration of fish. Molde, like most other fishermen here, lives in a house in an area on the southern half of the island known as Macuti (thatched) Town. This area represents the African essence of the island while the northern half, known as Stone and Lime Town, contains the Portuguese settlement which was built up around the port and the large military fortress. The division of the island is marked by an imposing semi-abandoned hospital which creates a clear architectural and cultural fracture between the different settlements. 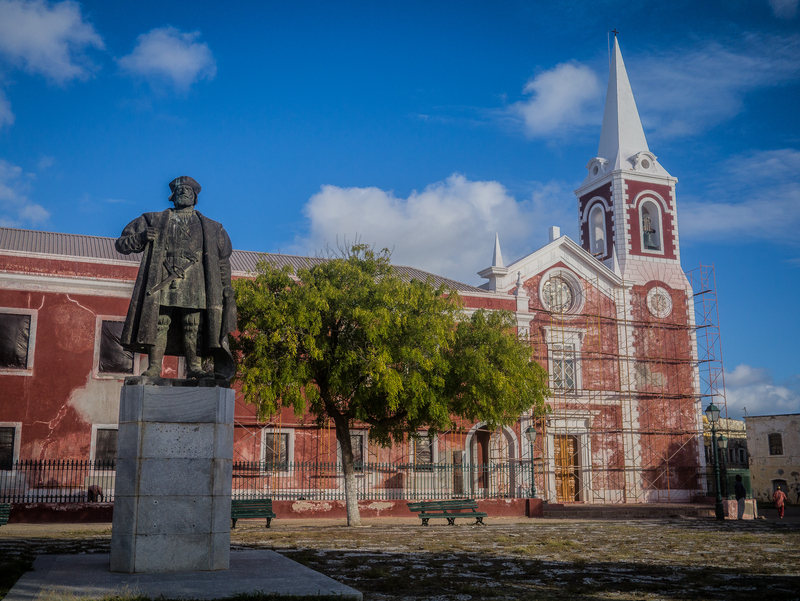 The Portuguese built sturdy government buildings and homes in the colonial style of the time. In order to do this they dug up chunks of the coral reef that the island rests on. The coral was sourced from the southern part of the island and made into building blocks. Over time, in the negative space that was left by the coral pits, locals, Indian workers and people from the mainland set up their own structures. Traditional homes were built by creating a frame made out of fine straight rods sourced from nearby mangroves. These were filled up with a clay mixture which was painted over with a lime compound. Today, most of these houses are built with cement bricks; some have corrugated iron roofs although most still use macuti. The houses are still built according to their historic design and Molde’s home reflects their traditional layout. In front of his main door is a low portico on which women sit and chat or do each other’s hair. Through the front door there is a dark corridor with rooms on either side. At the opposite end of the corridor a door opens onto a narrow courtyard. To one side there is a pit latrine. In the middle there is a well which gives slightly saline water that can only be used for washing purposes. The fogao, an iron burner that functions with coal, stands by the wall. Everyone in Macuti Town cooks outside. Houses on the north side of the island are instead built with thick walls that hide spacious, leafy courtyards with rooms and porticos that give onto them. On their roofs are benches and verandahs from which to enjoy the evening air and watch the ocean. Many of these colonial houses are today in a state of abandon and disrepair, although in recent years some of them have been restructured by hoteliers who have tried to conserve the original feel, preserving frescoes, original colours and features. The main government buildings were almost all at one point or another abandoned. The old maritime customs stands empty: the dust is inches thick and documents half a century old are strewn across the floor. A family has taken over one of the wings of the building; in the hours before the sun goes down the women sit outside on mats and the children play and heckle dogs. 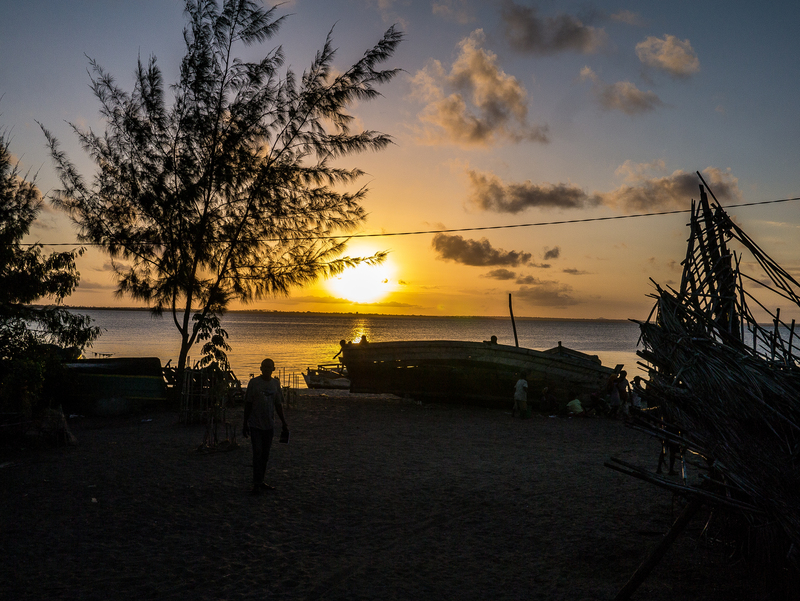 Ilha de Mozambique was designated a World Heritage site by UNESCO in 1991, just before the end of a civil war that spanned almost two decades. Between the years of 2006 and 2010 funds were invested in renovating the huge fortress that stands on the northern tip of the island. 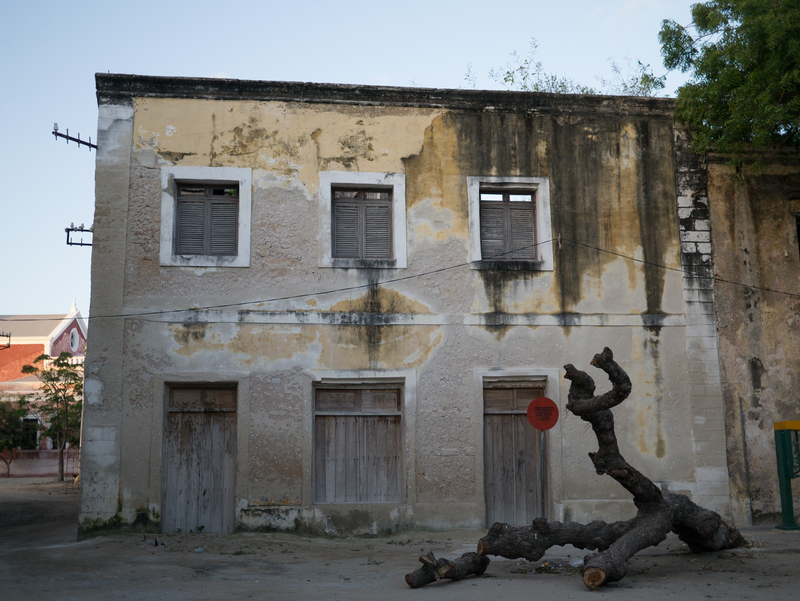 During that time, the Mozambican government also moved to promote the rehabilitation of buildings in Stone Town and raised funds to repair and conserve around 500 houses in Macuti Town. Conservation and restoration efforts initially focussed exclusively on the fort and other monuments of architectural importance. Following this, attention was diverted to what was termed as the “uncontrolled development of Macuti Town”. A 2010 UNESCO report stressed that the authenticity of Macuti town was being threatened due to high levels of migration from the mainland and that the construction of new houses risked impacting on the areas’ historic urban features. The concern was that as the tangible elements of local culture disappeared, so would the unique identity of the Macua people on the island. “The people of Ilha are by their nature tolerant and have accommodated new arrivals over the years” recounts Hafiz Jamu, a local development professional who works for Technoserve, a US NGO that strives to create effective business solutions to poverty. “Yet in doing so, they have allowed their own traditions and heritage to be diluted. Technoserve is currently working on attracting foreign investment to Ilha in order to improve infrastructure and create an environment that will be conducive for the development of a vibrant tourism industry. According to Jamu, the company is trying to approach the question of cultural valorisation cautiously, as they wish to achieve the right balance between development and cultural conservation. Molde resurfaces twenty metres away from the dhow and indicates in one direction. The men onboard pull out six oars which they fasten to wood pegs, crammed into square holes carved into the top edge of the boat. The men start to row, a call and answer tune begins. A rope is thrown to Molde who treads water. 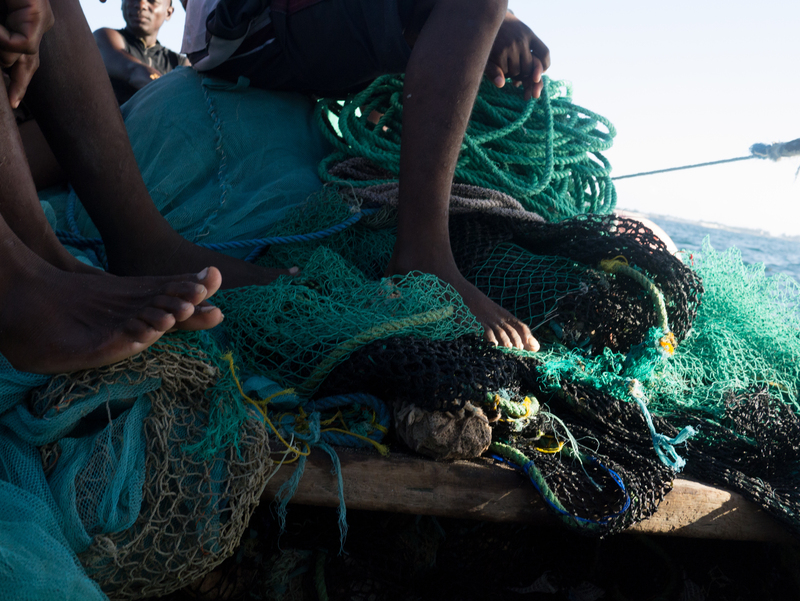 Two men start dropping nets; they feed them overboard. The others keep on rowing, singing, the sound ebbing and flowing with the splash of the oars in the water. The nets are now spread out in a wide line. A second man picks up mask and snorkel and jumps in. Behind his mask he slips a series of long reeds. These are needed in case the net tears and needs some on-site first-aid. He swims back and forth along the net to make sure it has not snared. At a signal from Molde a man casts the anchor. The water is not deep. Singing voices from nearby dhows float over the water. The men start pulling the ropes back, they let them drop in a heap. Slowly the glistening mesh is piled back into the hull. The men strain visibly. The net comes up empty. The mood sours but there is no time to dwell. The men start rowing again and the process repeats itself a hundred metres in another direction. After a signal the men start pulling again. They are bare handed. The wet rope squeaks through their hands. Energy levels fluctuate, no songs are sung, this passage lacks the hypnotic rhythm of the rowing. Up comes the net. This time out stream a pile of fish, enough to fill a plastic crate half way. Some of the fish are about a foot long; many of them are no more than a few inches. The men pick through the catch with the snorkels. They discard seaweed and small blowfish. They keep everything else no matter how small. Third net thrown. Another successful catch, the crate is already full. Fourth and final throw. The boat has been at sea for five hours now. The fish are lying in the hull gently flapping on the tarpaulin. The fact that Ilha is once again on a cultural map is undoubtedly positive. Difficulty of access and lack of infrastructure have meant that for years the location hardly featured on anyone’s radar. In recent years the government of Mozambique has focused on relocating people in the “uncontrolled” part of Macuti town to new residential plots, installed sanitation facilities in both of the island’s towns and moved to designate beaches as leisure places and not simply outdoor toilets. But any lasting intervention that takes place must take into account the needs of a largely-uneducated community and make sure that they benefit from tourism or other potential economic projects. This is especially important as fish stocks in the sea dwindle and people cannot hope to rely solely on fishing as a means of subsistence in the future. “I remember when I started fishing the ocean was more full than it is now,” says Molde. “We used to come home with crates and crates and the fish were big. Now everyone fishes with fine mesh nets and the fish are disappearing. We only catch one maybe two crates a day and only a few of the fish are big. Molde doesn’t see that any immediate benefits are to be had out of tourism beyond creating a bigger market for his daily catch. His lack of concern is echoed by many around the island who are still in daily survival mode and do not concern themselves with long-term plans for the future. This is a characteristic of many parts of Africa, where long-term plans are usually the preserve of development practitioners and investors, who tend to see a bigger picture where locals simply focus on getting through the day. The tasking of including the community in articulating and later dictating the terms of their own growth is a challenging one. Fishing is the only life men like Molde, who left school when he was nine, have ever known. Until recently illiteracy levels were high and the sight of groups of school children on the streets is a relatively new development. It’s hard to talk of community-led growth when the community is itself has not had the opportunity to give any thought to what options they might have. Technoserve would like to see Ilha turned into a world-class tourist destination. To do this it is focussing on acquiring houses, doing them up, selling them to wealthy foreigners and with the money made starting up the cycle again. Already there are a couple luxury hotels in the area, a few mid-range ones, with other new establishments in the pipeline. But Ilha is out of the way, expensive to get to and only the most persistent of tourists make it this far. The opening up of an international airport in Nacala, 150km to the north, where the biggest deep water port in the region is currently under construction, might go some way towards making access easier. However the government of Mozambique is currently focussed on the oil and gas that has been uncovered in Capo Delgado province to the north and the immense coal reserves from Tete province to the west. The money to be made from resource exploitation far exceeds that to be made from tourism and as a result this sector is not a top priority. Using tourism as a means to improve the lives of the inhabitants of Ilha could be a successful approach. But it would be foolish to pin all hopes on this one strategy without fully investing in creating an enabling environment within which it would flourish. In order for the benefits of tourism to trickle down to the a majority of the inhabitants of Ilha, it would be necessary to devise a holistic approach that ensures people have the skills needed to be employed in the tourism industry. This would imply training people as plumbers and electricians as well as in traditional carpentry, construction and iron working skills – so that it is they who get employed to make the doors, windows and other fixtures and fittings of the buildings under renovation. Additionally there would have to be a focus on providing training in hospitality – from managers, to waiters, to bar staff and beauticians, the services that tourists expect to have when they travel to seaside locations. If a section of the residents of Ilha are not proficient in these different areas, what will happen is that other people will be employed to do the jobs instead. Once people from the outside are employed to work in the tourism industry, the people on the island will lose out and be increasingly marginalised from dictating the terms of their own development. “People need to be trained and be able to organise themselves if they are to have any say over what happens here in the next decade or so” concludes Juma. “They must identify what aspects of their own culture they believe should be valorised. They need to understand how their interaction with modern technology can help promote their values and maintain a strong cultural identity which in the long run will benefit them both economically and socially”. As the dhow sails in with the afternoon tide the buyers, mostly women, wade out into the sea to greet them. Before they have come to a full stop the negotiations over the catch have already begun. 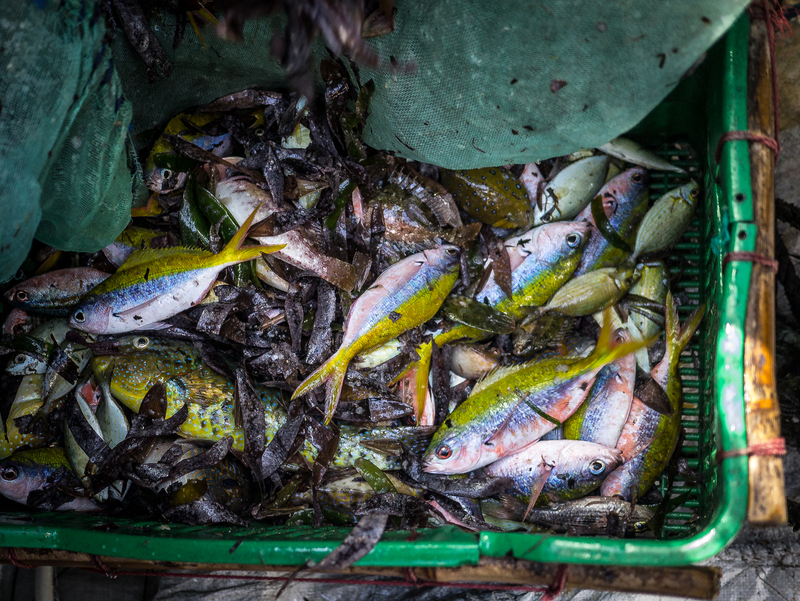 The buyers help unload the fish and begin to divide them into plastic buckets. Bargaining and negotiations between the principal buyers and those further down the chain carry on until the beach. Women stand on the beach with buckets on their heads. Young men stride off with the fish strung up on long reeds like daisy chains. 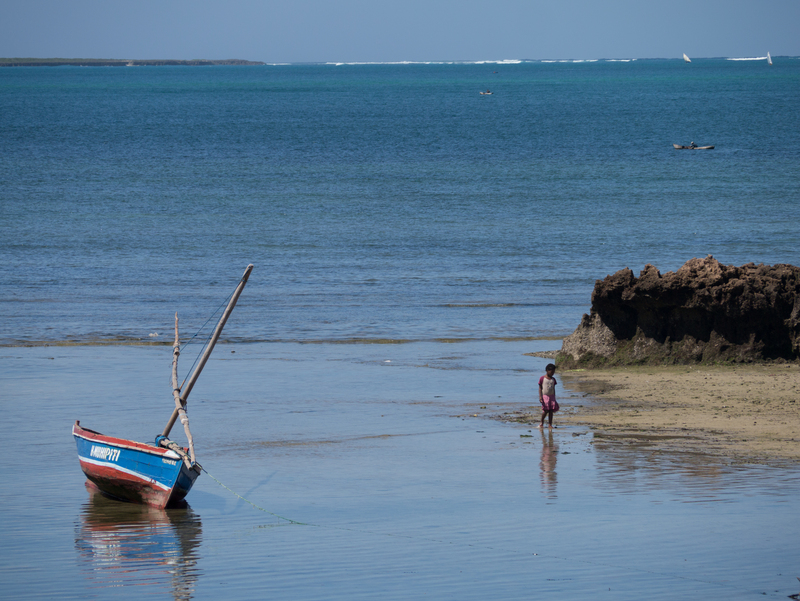 It’s hard not to view such a scene through a romantic prism: fishing on Ilha represents a way of life and one’s natural instinct is to want to preserve, not modernise and develop it. But times are changing and the fish are diminishing and if Ilha residents are to maintain some form of harmony with their environment, they will have to begin to look at the bigger picture and make sure that they become personally involved in any future plans for their island.